8 Amazing Home D?cor DIY’s Farmhouse Style!! If you are anything like me then you often find yourself rummaging through Pinterest for ideas!! I find that the phrase I search time after time is home d?cor DIY’s. I love home d?cor DIY’s for a variety of reasons. Home d?cor DIY projects give me the outlet to do something creative which I need A LOT of!! Feeling like I have something to do that is fun creative and even useful really brings me joy!!! 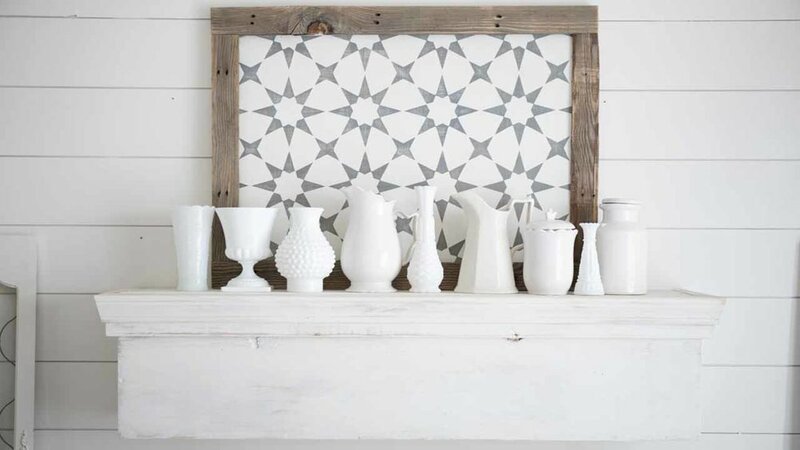 I also love home d?cor DIY’s because they are often times a very budget friendly way to decorate my home! please note this post contains affiliate links. My husband and I were married at 19, he had moved from a different state just a few days before our wedding and he didn’t even have a job yet!! reality came at us hard! We were married on a Friday and Monday I reported for my first day of training at a bank I would go on to work at for several years. We didn’t have some fancy honey moon waiting for us the week after our wedding, we had bills to pay and a new apartment to get settled into. Don’t get me wrong we were 100% blissfully happy!! We were so dang happy to be married and finally on our own doing our thing that we didn’t care that it meant making sacrifices and that we had to work hard right out of the gate! But it also meant that as we were just getting our lives started there was no extra! Not even a few dollars to spare to decorate or furnish our new apartment. We moved in without even having a couch or a TV. Ha ha! Looking back I have gotten so used to life now, I would have had a cow if I didn’t have those things! But it truly didn’t matter! And so we saved and the day our first couch arrived on our doorstep was like Christmas morning. Eventually we got settled and I was finally able to tackle some d?cor! I quickly learned that DIY home d?cor projects were going to be my best option to make my money go further!!! Number 1!! First we have a simple sewing home d?cor project!!! Confession!! Up until a year ago, I didn’t have a single throw blanket!!! I know what the heck is this self proclaimed home d?cor blogger doing without a throw blanket or 2?! I don’t even know myself I just didn’t want to spend the money on one to be completely honest!! 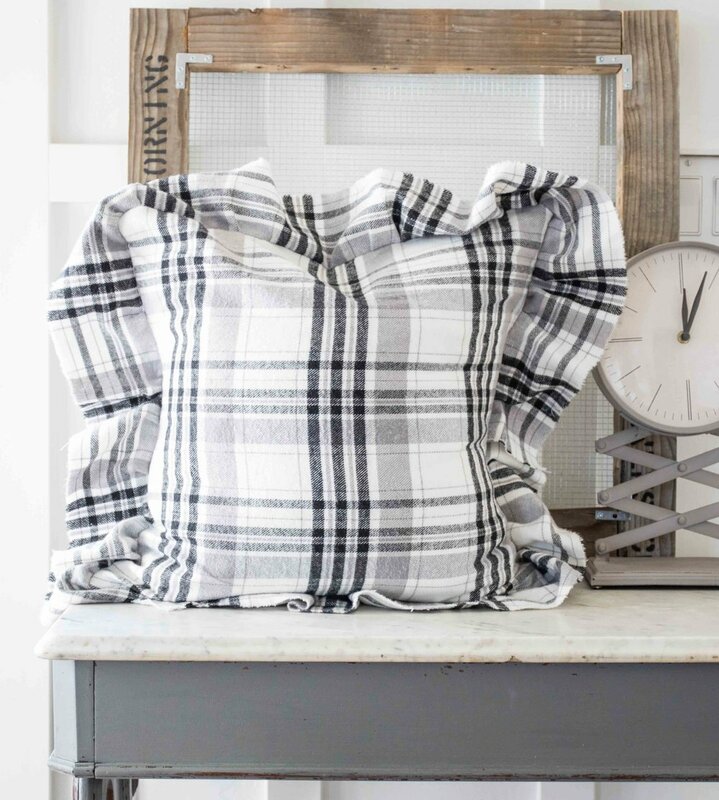 So if you, like me hate dropping the 30 or so dollars it takes to add throw blankets to your home d?cor collection, look no further than this simple and affordable throw blanket!! 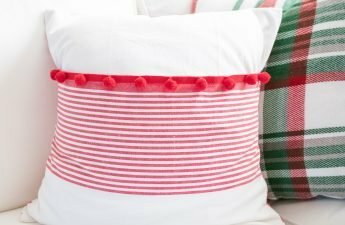 I made this using a yard of ticking stripe fabric that was less than $10! You can’t beat that!! Plus once you have made one you’ll want to make one for every chair, bed end, and sofa in your home!! You’ll now be armed with the know how to do just that and be able to make several for the price of one from the store!! See how I made it in THIS POST. 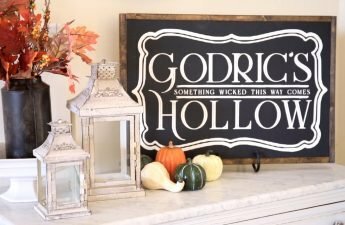 This is one of my favorite DIY home d?cor projects to date! WHY? because Its super versatile! you could make a set of these and display children pictures on them, or you can make just the one, like I did and switch it up from season to season! I love free printables if you’ve been around here for 5 min you already know that!! 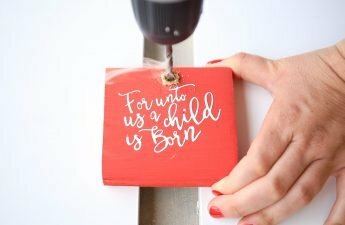 But, I love to put seasonal printables in the frame which I just tape right on and take off when I’m ready for something new! I have a full video tutorial for this project in the post as well! found HERE!? This is a home d?cor DIY that has also gotten a lot of love!! When I really feel like going all out and dressing up our gest room for guests, I’ll put this pallet wood serving tray at the end of the bed with some goodies like cookies or cake!!! I also have used it as a centerpiece over and over on my dining room table! I just put different vases, and dinner tureens on it and it adds texture and warmth to my white table! Video tutorial on how to make this home d?cor DIY HERE. This is a bit of a different DIY, its what I consider a layering piece for my home d?cor collection. I like pieces like this because they are a great way to really style an end table, add an architectural element to a gallery wall or even provide a simple backdrop for a banner like I did with this on my Christmas mantle this year! 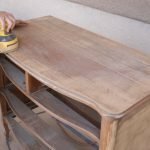 How I made this incredibly easy home d?cor DIY can be found HERE. I hope you found these 8 DIY home d?cor Tutorials inspirational and helpful in your quest to not only decorate your home but on a budget!! You can save this idea for later by pinning the image graphic below! thanks so much for doing so!!! 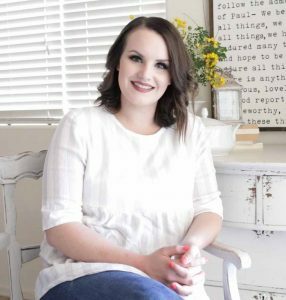 I love your style of decorating and your DIY projects. My DH and I married young. I was 18 when I married and turned 19 the next month. My DH was 19 and in college. We didn’t know anything but have been married 58 yrs this August and have two grown children. I love to decorate too and learn to sew curtains, clothes for my children, etc. I enjoy your style so much and your projects. Thanks for sharing everything with all of us.